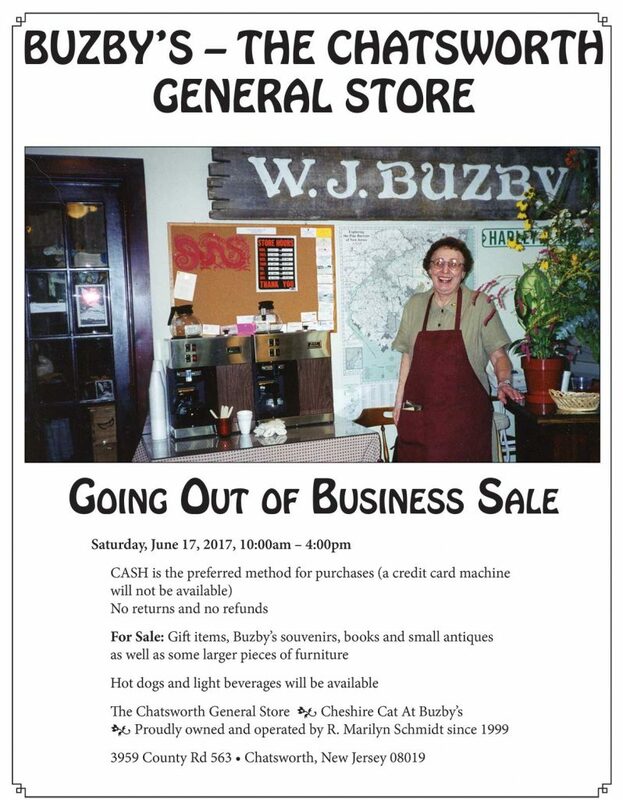 On Saturday, June 17, 2017, the iconic Buzby’s General Store in Chatsworth will be closing its doors when proprietor R. Marilyn Schmidt retires. Buzby’s has been a staple of life in Chatsworth since 1865 and hopefully it will re-open again in the future. The final sale will be cash only, and will not include the original historic Buzby pieces except for a few chairs. Other furniture and chairs will be available. There will be other items such as antiques, paintings and books from Marilyn’s massive library on cooking, gardening, etc. for sale. Hot dogs and light beverages will be available. 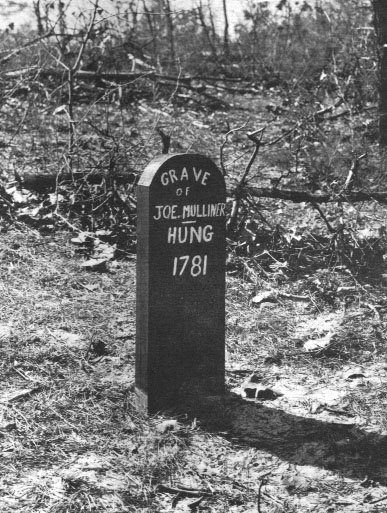 Those familiar with the New Jersey Pine Barrens have probably heard the legend of Joe Mulliner, the infamous outlaw who is said to have terrorized the inhabitants of the Pines during the American War for Independence. Yet, beyond the myth, there was a real man. What facts are known about him? What elements of the folklore can be dismissed as fictitious? This article sets out to briefly answer these questions by way of addressing a number of commonly repeated claims about Mulliner. Claim: He was lawless and indiscriminately plundered everyone he encountered. Was Joe Mulliner really a scoundrel who gave allegiance to no one and observed no law, as the story goes? According to the British, he was not. However, the Whigs painted him in a much different light. In 1781, the Grand Inquest of Burlington County claimed that Mulliner and his gang were “moved by the instigation of the Devil,” that they were “false traitors and rebels against the State of New Jersey,” and that they “captured and held citizens of the state as prisoners of war.” Shortly after Mulliner’s death, the New Jersey Gazette reported: “This fellow had become the terror of the country. He made a practice of burning houses, robbing and plundering all who fell in his way, so that when he came to his trial it appeared that the whole country, both Whigs and Tories, were his enemies.”  Such accusations were often leveled against Tory irregulars, and this particular case may have merely been an example of wartime rhetoric. John Watson, who was born at Batsto Village in 1778, claimed that Mulliner burned the home of his father, William Watson, who was a patriot and privateer, and took him to New York as a prisoner of war in November 1781. It was common for Tories to kidnap Whigs for ransom or to exchange them for Loyalist prisoners, but Mulliner would have been dead by the date Watson sets for the event, indicating either that Watson simply confused the date or that Mulliner had nothing to do with it. However, while the Whigs denounced Mulliner as a depraved soul who was guilty of horrendous crimes, the British painted him in a much more favorable light. According to Benjamin Franklin’s son, William, who, unlike his father, remained loyal to the Crown throughout the Revolutionary War, Mulliner was what was known as an Associated Loyalist. The Associated Loyalists were comprised of willing and able Tories who were hired to disrupt the activities of the Rebels. According to General Henry Clinton, the British Commander-In-Chief in North America, Mulliner worked for the British as a whaleboat privateer. This demonstrates a fact about Mulliner that is absent from the folklore surrounding him: He was a sailor. Beginning in 1779, in an effort to compensate for economic loss caused by the Rebel privateers, the British encouraged Loyalists to engage in privateering, a common wartime occupation for mariners. Mulliner was allegedly one of a number of such anti-insurrectionists and, given the fact that the British went to some lengths in defending him, it may be unlikely that he indiscriminately plundered both patriots and Tories, as charged by his detractors. Ultimately, it is impossible to know whether the British account or the Whig account reflects a greater degree of truth, but it is reasonable to suspect that perhaps both sides were construing Mulliner in such a way as to advance their respective agendas. On the one hand, the Whigs may have been set on demonizing Mulliner in order to foster patriotic sentiments. For certain, they were set on making an example of him in order to deter other Tories from engaging in such “criminal” activities. On the other hand, it is possible that General Clinton lied about Mulliner’s commission in order to bolster his case that the Rebels were engaging in “acts of cruelty and barbarity” against the Tories. Clinton’s accusation was not without merit, as it was not unusual for Tories to be tried and executed as prisoners of the state for committing essentially the same offenses as the patriots who were treated as prisoners of war by the British. Claim: He was the “Robin Hood of the Pines”. “The Robin Hood of Pines” is a title often attached to Mulliner’s legacy, but how much similarity actually exists between the legend of Robin Hood and the historical Mulliner? Not much. Like Robin Hood and his Merry Men, Mulliner and his gang lived in the woods (at least when they weren’t at sea) where they could more easily elude the law. Yet, with the possible exception that Mulliner and his men occasionally robbed people traveling through the woods, the similarities end there. That said, it is unlikely that Mulliner held up stagecoaches as is traditionally believed. If he had done so, it certainly wasn’t routine, judging from the utter lack of any record of such events taking place in the region. Moreover, historian David J. Fowler, who devoted an entire chapter of his PhD dissertation (Rutgers) to Mulliner, concluded that the claim that Mulliner’s gang numbered around 40 to 100 men is a gross exaggeration and that, based upon what is known about other Pine Robber and outlaw gangs, the real number would have probably been closer to ten. Claim: He hid out on Rabbit Island. An oft-repeated element of the Mulliner myth is that he and his gang hid out on an island at the Forks of the Mullica River, where the Atsion and Batsto creeks converge. This island is known as “Rabbit Island”, and oral tradition has it that goods were stored in warehouses here during the Revolutionary War. The island is located right in the middle of what was once one of the hottest centers for patriotic privateers and smugglers along any New Jersey river. When one considers also the fact that the island would have lacked sufficient tree cover due to logging, it becomes clear that there is no substance to this particular tradition. A more feasible tradition holds that Mulliner and his gang hid out in the nearby Mordecai Swamp, a large tract of cedar forest stretching from Batsto to Bulltown that was owned and logged by Mordecai Andrews in the early 1700s. It is said that they had an encampment on one of a number of island-like areas of high ground that are dispersed throughout the swamp. Mulliner and his men would not have lingered for long, however, and likely made transient encampments throughout the Pines as they moved about carrying out their missions. It is not unreasonable, however, to surmise that Mulliner would periodically return to Mordecai Swamp or other suitable places in the vicinity. With all of the patriotic activity that took place at the Forks and Batsto, and given Mulliner’s supposed familiarity with the area, it would make sense that he would frequently come back to carry out the work that the British government commissioned him to do. However, it certainly would have been a risky undertaking, considering the presence of armed soldiers, militia and patriots at these locations. According to oral tradition, Mulliner lived with his wife (whose name is not known) on her property along the Mullica River in present day Sweetwater before he had to flee as an outlaw, but this has yet to be confirmed through historical records. If it is true, then perhaps he would have sometimes traveled under the cover of darkness to visit her when he was nearby. Local lore holds that the family dog was trained to relay messages between Joe and his wife by means of crossing the river with notes tucked into a special collar. Another legend holds that Mulliner and his men would cross the river by means of using cedar branches as camouflage. These stories make for good folklore but can neither be discounted nor proved. 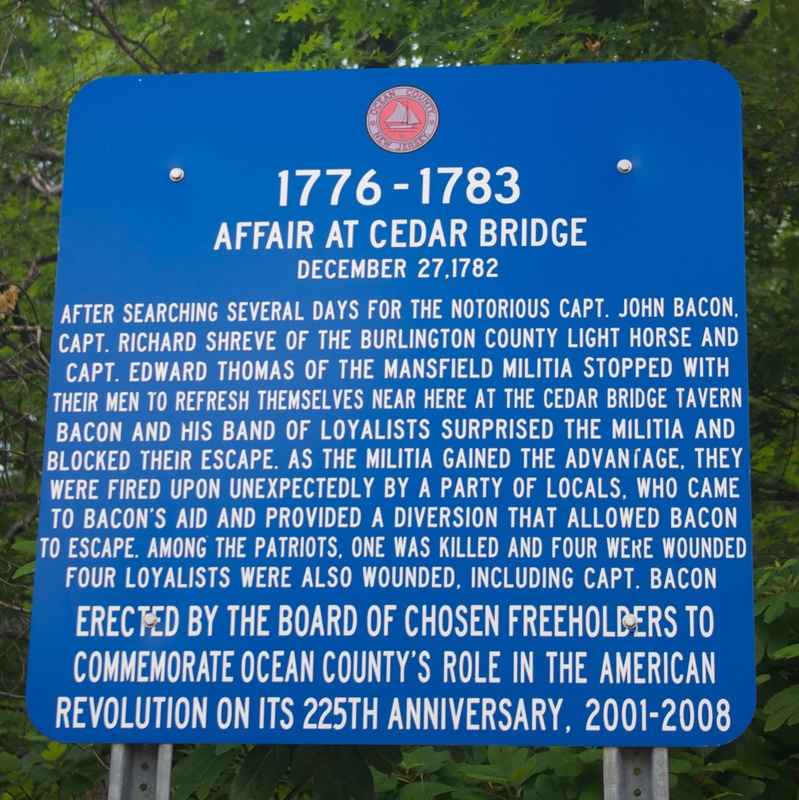 Claim: He would frequent the tavern at Quaker Bridge. Claim: He was arrested at the Indian Cabin Mill Inn in Nesco. Claim: He was hung along the Mullica River. Tradition holds that Mulliner was hung from a tree at a place called “High Bank” on the south side of the Mullica River, but the historical record shows that he was hung at Gallows Hill in Burlington City, where Laurel Hill Cemetery is presently located. Everyone sentenced to death by the Burlington Court met his or her fate at Gallows Hill, and Mulliner would not have been an exception. His sentencing resulted in some controversy with General Clinton decrying Mulliner’s hanging as unlawful. Clinton noted that because Mulliner was commissioned by the British government he should have been tried as a prisoner of war. Instead, he was treated as a prisoner of the state and was charged with felony and high treason. Mulliner pleaded not guilty and allegedly presented proof of his commission, but to no avail. The judge sentenced him to death after citing the fact that he owned no property, which must have made him expendable in the eyes of the court. Claim: He was buried at High Bank (or at Crowleytown). Read’s Landing (of Charles Read fame) was located on the south (or west) side of the river just below the mouth of Lucas Branch, which flows into the Mullica immediately downstream of High Bank. The initials are that of John Monrow who had this land surveyed and then conveyed to Benjamin Brush in 1765. We can be certain that it did not signify Mulliner, who owned no land. The folklore surrounding Joe Mulliner is interesting but can be determined to be largely fictitious. However, the little that we do know of him through historical records proves to be quite interesting nonetheless. Extracting the historical Mulliner from the legend proves to be a stimulating albeit difficult task that raises many questions, some which are unanswerable and others that have yet to be answered. Burlington County presentment, n.d. (c. 1781). NjMoHP, reel 37. NJA, 2d ser. 5: 282. Watson, Annals of Philadelphia, and Pennsylvania, in the Olden Time (Philadelphia, 1898), vol.3, 12. Burlington County indictments, November 1780, NjBuHi. * For further reading, see Egregious Villains, Wood Rangers, and London Traders by David J. Fowler, which includes a chapter dedicated to unraveling the legend of Joe Mulliner and is the most comprehensive historical work on the subject to date. I am indebted to Fowler for the research behind a significant portion of this article. It was the summer of 1968 that we met by chance on the edge of the West Plains near Coyle field. While photographing buck-moth caterpillars, I noticed a crouching figure nearby that I presumed was a piney gatherer. This notion was quickly dispelled when he introduced himself in a clear Bostonian accent as Howard Boyd, an entomologist and an administrator with the Boy Scouts of America. He said that he had been coming to the Pine Barrens for many years, especially to study tiger beetles. Little did I suspect that this encounter was the beginning of an enduring friendship that would last until Howard’s recent death on December 20, 2011, at the age of 97. Having produced several fine 16 mm nature films (e.g., A Place in the Sun and Life on a Coastal Plain), the Boyds were popular touring lecturers in the Audubon Society’s Wildlife Film series during 1966 to 1976. 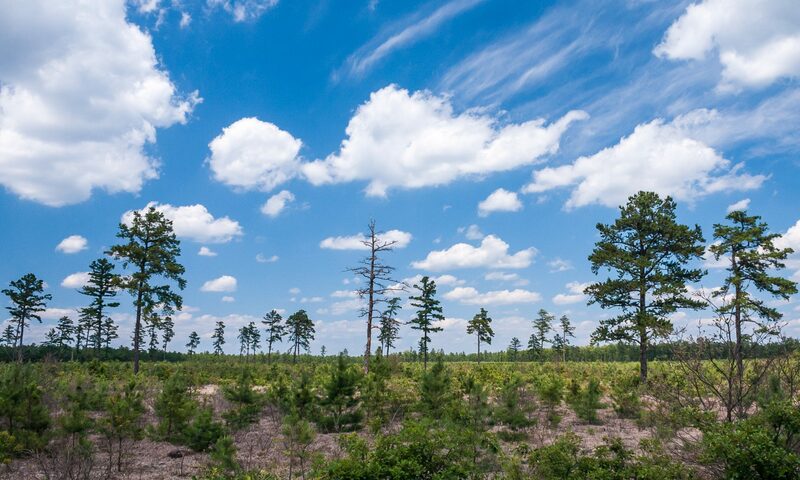 When Howard and his talented wife Doris moved to Tabernacle, NJ, in 1969, our lives became frequently intertwined in exploration and preservation of the Pine Barrens. As members and officers of the Burlington County Natural Sciences Club, Howard and I led or participated in many field excursions into the Barrens, exchanging ideas and sharing our independent research. On three occasions in the 1970s, the two of us set out on day-long surveys determined that we would be able to rediscover an occurrence of the long-lost post-oak locust, Dendrotettix quercus, swarms of which had devastated oak forests in the vicinities of Bamber, Ridgeway, and Mt. Misery during the early 1900s. Although unsuccessful in finding any specimens of this destructive grasshopper, we both remembered these excursions in later years as fine opportunities to becoming better acquainted. Similarly, our paths crossed frequently at Whitesbog in the 1970s, where I was conducting extensive botanical surveys and was engaged as a botanical consultant by Dr. Eugene Vivian (Glassboro State College, now Rowan), Director of the Conservation and Environmental Studies Center (CESC). I clearly recall Howard’s delight when he accepted Vivian’s offer to be a nature study instructor in the program. The “boy scout” eternally flowed in Howard’s veins, and he derived immense joy from passing on to youngsters his vast knowledge of the natural world. 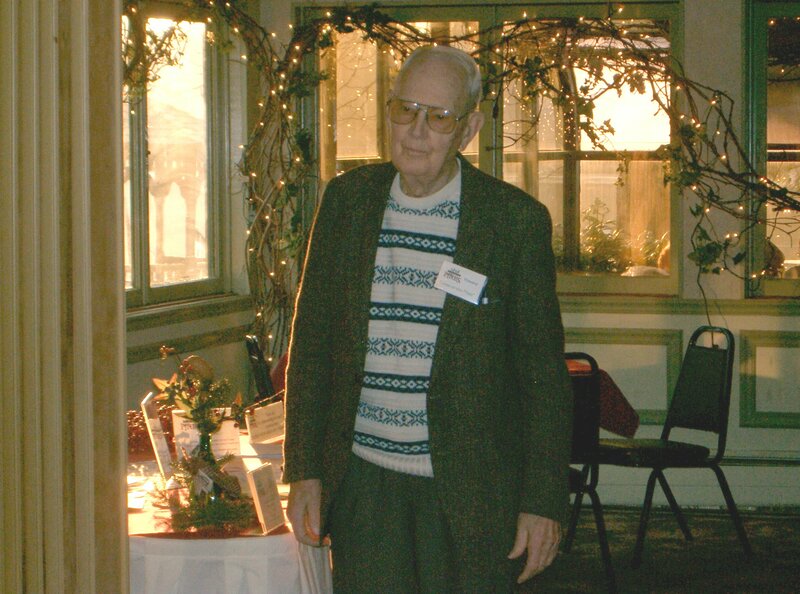 When Vivian retired in 1984, Howard continued to serve as an instructor for several more years under Garry Patterson, director of the same program, but under a new name, the Pinelands Institute for Natural and Environmental Studies (P.I.N.E.S.). Howard Boyd, at Lines on the Pines. Photo courtesy of Linda Stanton. Howard, among others, convinced his Audubon Society colleagues to establish in 1977 the Rancocas Nature Center in Westhampton, under the capable directorship of Karl Anderson. Howard also supported Anderson’s brilliant idea of holding an annual Audubon Society’s Pine Barrens Weekend, a three-day event each June, at a church camp on Mt. Misery. Fondly edged in my memory are our thirteen years of involvement (1981-1993) as lecturers and trip leaders at this popular annual event. The comradeship was incredible, and we both looked forward to learning from each other and other leaders, especially during the Saturday evening informal “wrap-up” session that reported the finds of the day. As a scientist, Howard P. Boyd, a former president of the American Entomological Society (1977-1981), was first and foremost an entomologist, but an entomologist with a strong background in multiple facets of Pine Barrens ecology. His field of expertise was tiger beetles. On unannounced visits to his home, I invariably found him engaged in his entomological studies or devotedly editing the society’s Entomological News. He served as editor for almost 30 years. Among his scientific publications that may be of interest to the layman are “Collecting tiger beetles in the Pine Barrens of New Jersey,” Cicindela 5:1-12, 1973; (co-authored with Philip E. Marucci); “Arthropods of the Pine Barrens,” in (Foreman, R.T.T., ed. ), Pine Barrens: Ecosystem and Landscape, Academic Press, 1984 (co-authored with Philip E. Marucci); “Host plants of cranberry tipworm,” Cranberries: The National Magazine 48:6-9; and “Arthropods taken in pitfall traps in the Pine Barrens of New Jersey,” Entomological News 106:45-56; 1995. When Howard came to my home in 1990 to deliver a copy of his manuscript, A Field Guide to the Pine Barrens of New Jersey, that he wanted me to review (particularly the section dealing with the plants), I was at first pleasantly surprised that he had chosen me. Then suddenly it occurred to me that he had referred to me as “My Botanist” for many years now, and we had cultivated a strong friendship and a mutual respect for one another’s abilities. He indicated that the guide offers nothing that is really new, but is packed with a gamut of information that will answer just about any question that a Pine Barrens novice might have. I soon discovered how right he was and told him that I had no doubt that his guide would be in demand for years to come. Twenty-one years have passed since its publication and the book’s popularity has not waned. A second book titled A Pine Barrens Odyssey followed in 1997. It is a pleasant read that takes the reader on a journey of the Pines through the four seasons. This was followed in 2001 by Wildflowers of the Pine Barrens of New Jersey, a beautifully illustrated volume of 130 photos (with descriptions) featuring primarily Howard’s photos of common as well as rare species. About a year before its publication, Howard asked me to show him a site of one of our rarest plants, the southern yellow orchid. It was subsequently depicted in the book. 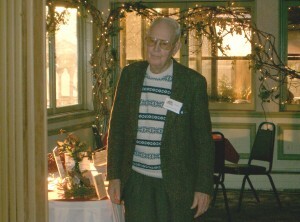 Howard’s final book, The Ecological Pine Barrens of New Jersey, was published in 2008, when he was 94 years old. Once again Howard asked me to conduct a review. In the Preface he states, “I claim no original authorship for the material within this offering.” His aim was to assemble in a single volume “the most important subject matter” on all aspects of the ecology of the Barrens, eliminating the necessity to consult other references. He believed the book could serve “as an introductory text for courses at the upper high school and early collegiate levels.” This book was not an easy one to write, and I marvel that Howard, at such an advanced age, had the fortitude and prowess to pull it off. Hopefully, an instructor or two will test its efficacy in the classroom. In many ways Howard Boyd was a remarkable man who led a very productive life. Those of you who were fortunate to have him as a teacher can attest to that. He left behind a legacy of four books that reveal his broad spectrum of interests and knowledge. His outstanding field guide will, no doubt, stand the test of time. It was a privilege to have Howard as a friend for more than 40 years, to have walked with him the trails of our beloved Pine Barrens on many occasions. Allow me to share his generous tribute that he wrote on the title page of my copy of his The Ecological Pine Barrens of New Jersey. I shall always cherish these kind words and Howard’s memory. You will be missed, my friend. Farewell! In the woods North of Woodmansie, in Byrne State Forest, five lonely sand roads come together in a wide clearing. I had been exploring the area around Union Clay Works earlier that day, and decided to head up to Buckingham to try to find cellar holes and the ruins of the railroad station. Driving North along Buckingham Road, the trail split, and I drove left, passing along a part of the woods that seemed particularly dreary. I made my way to the intersection, randomly driving along forgotten sand roads, while keeping an eye on my GPS to keep me from getting hopelessly lost. 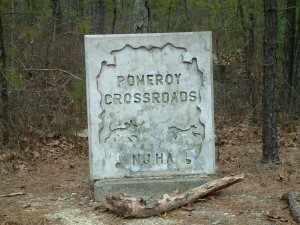 Out of the corner of my eye I saw a cement marker with the inscription “Pomeroy Crossroads” carved. I had never heard this place mentioned in any books or discussion with fellow Lost Town Explorers, so I took a picture and headed on my way, determined to find out what this place was. A month or so slipped by without any further clues as to what this place was. I had nearly forgotten about it until I bought a copy of Chaseworld – Foxhunting and Storytelling in New Jersey’s Pine Barrens by Mary Hufford. 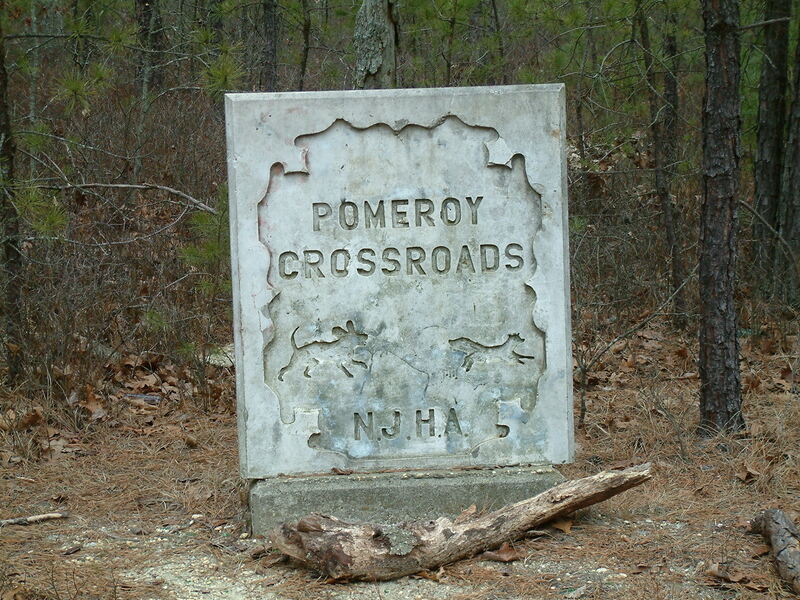 Finally, I was able to get some information on who Pomeroy was and why there is a marker for him in the Pine Barrens!The sport of foxhunting, which normally draws images of hounds crashing across the fields of England, is alive and well in the Pine Barrens, where it has developed it’s own unique identity. Instead of men on horseback, pickup trucks are used. Instead of shouts and yells between hunters, a CB radio keeps them all together. Donald Pomeroy was one of those hunters. In 1985, right before the opening of deer season, he lost control of his pickup truck and crashed into a tree. The New Jersey Sporting Dogs Association placed the marker there in memory of Donald Pomeroy, who had been a well respected member of the foxhunting community. 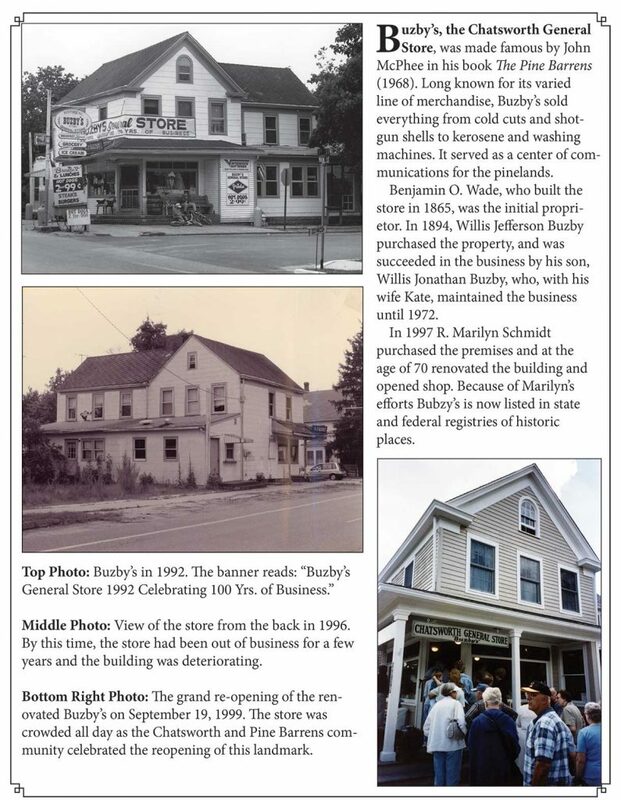 This article was first published on NJPineBarrens.com in 2003. In his final years, Charles Read suffered illness and endured tragedy. For as high as Read soared, becoming one of the most notable politicians of the day, one of the largest land owners of New Jersey, and the greatest ironmaster in the province, his final years left him in very poor health and nearly destitute. 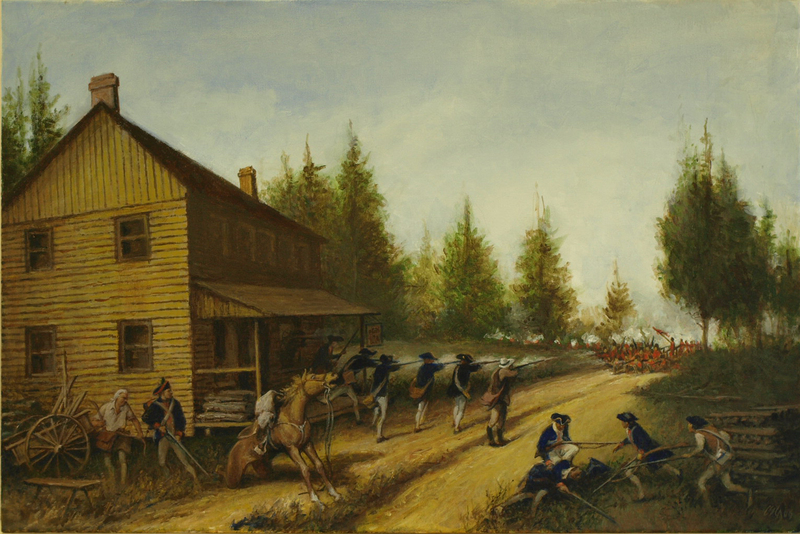 The end of the French and Indian War led to a financial depression which severely affected the price of land, rendering Read’s vast holdings significantly less valuable. The iron furnaces, with their expensive labor, shipping costs, and near constant upkeep requirements, continued to be a drain on his finances. The salaries and fees collected from his political appointments failed to cover the costs for the furnaces – especially as Read became increasingly ill and unable to perform his duties. In 1768 he secured a mortgage on the Etna tract for ₤500, which held the wolf at bay for a while. Alice, knowing that she would soon pass, prepared a will providing for the distribution of her estate, which contained a large amount of land in the West Indies. The estate was split evenly between her husband and their son, Charles Jr. with a trust fund established for their son, Jacob, who had turned out to be idle and irresponsible both in money and morals. While Charles Jr. did not have the same level of aspirations and ambitions that his father possessed, he proved to be a capable businessman and did a fair job managing the iron works at Etna and caring for his father who, following Alice’s death, moved to Etna. Death did not quickly leave the Read household. Less than one month after Alice passed, Charles Read IV, the 13-month-old son of Charles Jr. died. He was buried at the Evesham Friends’ Meeting in Mt. Laurel. Whereas Charles Read, Esq. ; for the recovery of his health, as well as for securing and recovering some large sums of money due him in the West-Indies, has lately embarked thither, and, being desirous of preventing any uneasiness among such as he may owe money to, has appointed us as the subscribers, trustees, to make sale of such parts of his estate, as may be necessary for the discharge of his debts, which we purpose proceeding to do so as soon as possible. We therefore desire all persons who have any demands against him to bring in their accounts, properly proved, that they may be settled; and all who are indebted to him, by mortgage, bond, note or book-debt, are desired immediately to discharge their respective debts to the subscribers, who are authorized to receive the same. Charles Read, Junior; Aetna Furnace. Without the money from Alice’s estate it seems as if Read gave up on the idea of returning to New Jersey to settle his debts. It is likely that the collapse of his empire, the death of his wife and grandchildren, coupled with the disappointment of not being able to settle his debts through the estate of his wife drove him to the brink of sanity. 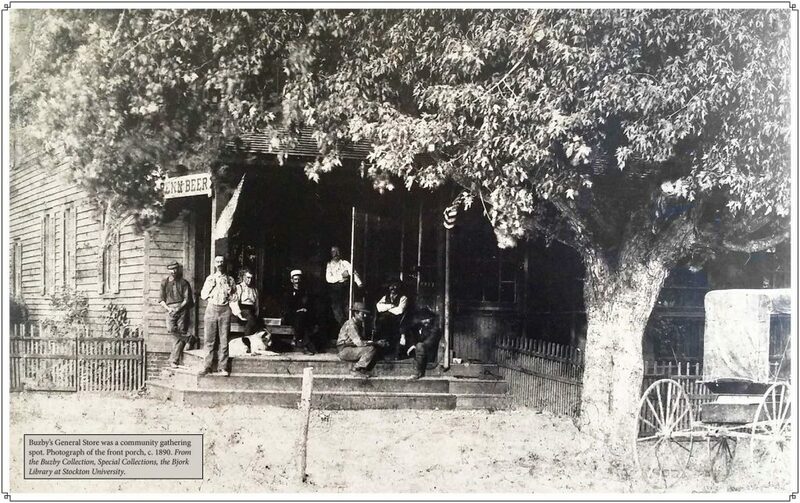 Sometime in November 1773, he left St. Croix and opened a small general store in Martinburg, North Carolina. On December 27, 1774, Read died without leaving a will, and without having an opportunity to say goodbye to his family and the land upon which he built his empire. Charles Jr. did not learn of his father’s death until May of 1775. 6. Henry H. Bisbee, The Burlington Story. Vol. 9, No 1. 1979, pg 4. As mentioned in the first installment of this article, the senior Charles Read was a partner in the first ironworks in Bucks County, and the manufacture of iron was a fascination that never left the younger Read. By the mid 18th century, ironworks began opening all across the northern counties of New Jersey, and landowners in the south were eager to get in on the action. South Jersey has all of the ingredients needed to create a virtually self-sustaining iron industry. The little rivers that cut through the pine forest, many already dammed and powering sawmills, could be used to power the bellows and hammers required for forges and furnaces. The pine forest itself provided fuel for the furnace in the form of charcoal. Finally, bog iron, a naturally occurring ore that developed in the slightly acidic bogs and swamps, was abundant and easier to obtain than furnaces in north Jersey that had to extract iron from mines dug deep into the mountains. Read, having already owned large parcels of land yielding bog iron, focused his attention acquiring land around Atsion, Batsto, Etna, and Taunton. In 1755 he signed a 999-year lease on 1,128 acres along the Atsion Creek. Ten years later he purchased a large parcel of land in the Forks of the Atsion and Batsto Rivers and a one-half interest in Richard Westcott’s sawmill in the area. Read also purchased rights to mine iron ore and cut timber on adjacent lands. An Act to enable the Honourable Charles Read, Esquire, to erect a Dam over Batstow Creek; and also enable John Estell to erect a Dam over Atsion River. And whereas the Honourable Charles Read sets forth, that he hath proved to Demonstration good Merchantable Bar-Iron may be drawn from such Ore as may be found in plenty in the bogs and . . . in such parts of this Province which are too poor for cultivation, which he conceived will be a public emolument; and that in order to erect the necessary Works, he had lately purchased a considerable Tract of Land laying on both sides of Batstow Creek, near Little Egg Harbour in the County of Burlington praying the aid of the Legislature to enable him to erect a Dam across the said Creek for the use of an Iron-Works; and in order to remove every objection against the Prayer of his Petition hath produced a certificate from Joseph Burr, Jun., purporting that he, the said Joseph Burr, is and for several years path hath been in possession of a Saw-Mill at the head of Batstow Creek aforesaid, from whence Boards only have been floated down but attended with such Expense as to afford a probability that the said Creek will not be hereafter used for the like purpose; hence the said Burr alleges that the Dam over the said Creek as petitioned for by the said Charles Read, can not be of any public or private detriment, but on the contrary greatly advantageous. Charles Read of Burlington, gives notice to the public, that he is possessed of several tracts of land, having in them streams of water, as constant and governable as can be wished . . . There is at all these places, plenty of food for the cattle from the middle of May to the middle of October. As Mr. Read’s situation renders it inconvenient to him to take upon himself the expense or care of works so extensive, he notifies to the public that it will be agreeable to him to let the conveniences to any gentleman of credit reserving a share of the produce, or to ender into a partnership with any persons of good dispositions, fortune, and integrity. Read constructed his first two furnaces at Taunton and Etna. Taunton, located on Haines Creek about three and a half miles from Medford, comprised a small furnace and a three-fire forge. Read completed Taunton in 1766. Other buildings included a coaling house that could hold 400 loads of charcoal as well as a house for the manager of the works and various outbuildings for the employees. Also located nearby was one of Read’s sawmills and an orchard. Read also completed Batsto Furnace in 1766. Located on the Batsto Creek, there was sufficient water power to drive four bellows and two hammer wheels. Unlike Etna and Taunton, Batsto was a five-way venture between the following partners: Read; Ruben Haines, a Philadelphia brewer; Walter Franklin, a merchant from New York; and John Cooper and John Wilson, both of Burlington County. The last of Read’s works, Atsion, dates to 1767-1768. 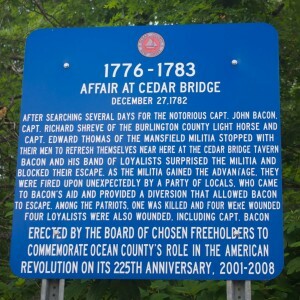 For a time, Atsion and Batsto, located a similar distance apart as Taunton and Etna, shared a smith, carpenter, and clerk. It is unclear whether Read retained this arrangement after he sold his interest in Batsto. Managing four ironworks, plus Read’s political duties, turned out to be too much for one person to handle. Falling iron prices made the industrial ventures unprofitable, and Read’s health began to fail. Between 1767 and 1768, Read sold his share of Batsto back to his partners – a half-interest to Haines, a quarter-interest to Cooper, and an eighth each to Franklin and Wilson. On January 26, 1768 Read sold a 249/1000 interest each to David Ogden, Jr. and Richard Saltar for £50. Presumably this was to lower Read’s financial risk in the venture while keeping majority control for himself. It took until 1773 for Read to finally sell Atstion. Taunton proved hard to sell, and, in 1773, Read turned it over to his trustees who listed it for public sale in 1774. Read’s son, Charles IV, assumed control of Etna, the largest of the works, after it had failed to attract a buyer. Charles Jr. continued operation for a while, but shortly afterwards had leased it to Jonathan Merryman. The furnace was eventually abandoned and ownership passed to William Richards. Reads ambition to become the greatest ironmaster in the province is likely what proved to be his downfall. While the iron enterprises were well thought out, the responsibilities of running them while simultaneously maintaining his public offices was simply too much for one man – especially one who was suffering health issues – to handle. In the final episode of this series we’ll follow Read as he flees New Jersey in a last ditch effort to rebuild his financial wealth and avoid his creditors. We left Charles Read off in the last article having moved to Burlington City in 1739. The elder Charles Read was dead, his familial home was sold, and presumably the finishing touches had been put on settling the estate. The stage was set for the younger Read to finally come into his own, and his offices, land holdings, and achievements he would have would blow the doors off anything that his father or grandfather had done. On November 10, 1744 Read was sworn in to the post of Secretary of the Province. This was a post appointed directly by the Crown, although usually given to someone who remained in England and then farmed out to a deputy that lived in the colony. The Provincial Secretary had an eclectic set of responsibilities including managing the correspondence between the Colonial Office in London and the government in New Jersey as well as maintaining records and documents such as birth and death certificates, land surveys, registrations, and writs. [i] The fees associated with each of the documents created were given to the secretary in lieu of a salary, making this position greatly coveted and incredibly powerful. Read quickly became friendly with Morris, and upon the Governors death on May 21, 1746 Read served as pallbearer for the funeral. With the passing of Morris, Read became nervous about his prospects in government, fearing that he’d be replaced by others. In 1748 he wrote James Pemberton, afraid that “an Irishman from Amboy” would replace him in office of Secretary. He wrote Pemberton again in 1757 and once again in 1759 about “renewing the contract” which was about to expire. Seemingly, Read did not need to worry. On February 17, 1762 he received a new commission from Governor Josiah Hardy. On May 20, 1751 Read took his place as assemblyman for the 18th Assembly after Governor Jonathan Belcher encouraged him to run for election. Likely due to the influence of Belcher, Read was selected for the post of speaker, despite this being his first year in the body. In addition to coming up with plans to fund the colonial government, which included the salary of the governor and other provincial officials as well as a stipend of 6s per diem for members of the assembly, an allowance of 14s per week for “use of a Room, Firewood, and Candle for the Council” the body was also responsible for issues of taxation. One of the first orders of the day was to settle the ancient conflict of how land was taxed – based on the quantity of land owned by an individual, or based on the quality of the land. The legislature was also asked to address various other issues. In 1752 the inhabitants of Morris County asked for relief from the inconveniences and damages from having “great numbers of cattle from the neighboring counties drove up into their county.” A petition of bolters set forth “that it is almost impractical to comply with the Act concerning Flour, because much wheat is threshed on earthen floors” and asked for an act to prevent the practice. Read also benefitted personally from his position in the assembly. In 1769 a law was passed giving owners of ironworks the right to provide employees with “Rum or other strong liquor, in such quantity as they shall from experience find necessary.” This law also made it illegal for anybody within four miles of Read’s ironworks, which will be discussed in the next article, to “entertain in or about their House, in idling or drinking, or shall sell any strong drink, to any wood-cutter, collier, or workman employed at said works.” A fine of 10s was to be levied for each offense, with the money to be spent on road maintenance. [iv] It was a brilliant piece of law for Read, who constantly battled with the effects of liquor on his workers. By putting the control of the quantity and type of liquor that could be distributed to his employees, Read could theoretically control how much they drank. Another example of his personal interests affecting public law was the 1759 sponsorship of a law “for the further Preservation of Timber in the Colony of New Jersey.” This was to replace the act “for preventing the waste of Timber, Pine, and Cedar Trees and Poles.” This act had been on the books since 1714, yet it’s “good intentions” had been defeated by people trespassing on land and cutting down timer that did not belong to them. The new act provided a remedy in the form of a 20s fine to anyone who should “cut, box, bore, or destroy any Tree, Saplin, or Pole” on lands that did not belong to them. [v] Clearly Read, with thousands of acres of woods, had an interest in keeping the trees for his own lumber interests. Read, while not a Quaker, frequently shared the ideals and opinions of the Society of Friends. While Native Americans in New Jersey had generally received fairer treatment than their brethren in the other colonies, there were legitimate grievances that needed to be settled. Many of the Lenape, the tribe native to New Jersey, felt that they had not been compensated fairly by settlers who came to occupy their land. Other complaints included the construction of dams made navigation impossible on some creeks that were previously accessible to their canoes as well as the use of large steel traps to catch deer. Things began to come to a head around 1755, with the French & Indian War underway, scaring residents into thinking that the Native Americans would possibly start attacking colonists. That year several Indians from Pennsylvania were held in the Trenton jail, despite New Jersey not having jurisdiction over them. Read protested their capture fearing that it might bring New Jersey into an Indian war which “of all Others is the most alarming and Ought to be Studiously avoided.”[vi] Read’s protestations were not for vain, and Governor Belcher ordered the Indians released to the governor of Pennsylvania. Read was in the forefront of the debate of what to do with the Indians, and in December of 1755 Read, along with Richard Saltar and Samuel Smith were named as commissioners to meet with the representatives of several Native American tribes. The commission met with success, and in 1757 the legislature adopted a series of reforms and guidelines limiting the size of steel traps, the sale of alcohol, the regulation of land purchases, and made illegal jailing a Native American for debts. On December 8, 1755 Read proposed the idea of creating a reservation for the Native Americans. Various lotteries were run and donations accepted to generate the money required to purchase the land for a reservation as well as settle any outstanding claims the tribes may have had. At a conference in Burlington on August 7, 1758 the representatives from the tribes requested a parcel of land be purchased in Evesham Township for a reservation for those Indians living south of the Raritan River. In exchange, all land claims and grievances the tribes south of the Raritan would be considered settled. £1600 was appropriated, half of that going towards buying the property and the other half would be spent settling claims that the northern tribes had. Despite being occupied by public life, Read began broadening his real estate holdings when he moved to New Jersey. By 1749 he wrote to James Pemberton explaining, “my estate lays chiefly in land.”[viii] He sold his properties in Pennsylvania and now focused most of his attention on land in New Jersey. Between 1740 and 1742 he sold a tract of land and a 250-acre plantation in Burlington County. 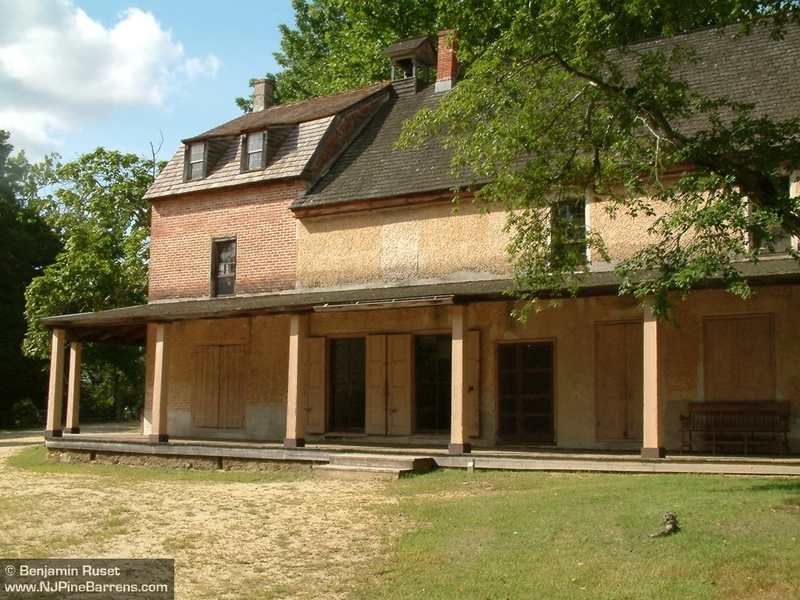 [ix] In 1741 he owned 8 acres by the Delaware River in Willingsboro Township. 1745 saw him purchase a 6 acre lot in Burlington, and the following year an acre lot in Burlington City on the east side of High Street. There’s no record of Read having built a house there, so it’s likely that he was just looking to hold on to the land and sell it at a profit rather than go through the hassle and expense of building a house for himself. Read tended to lean towards owning larger tracts of land. In 1744 he purchased 1,725 acres of un-appropriated land in West New Jersey. [x] In 1751 he received two grants from the West Jersey Proprietors – one for 5,378 acres and the other for 3,750. His holdings stretched from Burlington County to Morris, Hunterdon, and Gloucester Counties. In 1745 he purchased a tract of 2,000 acres on Cotoxing Creek below Lumberton and built a sawmill. Two years later he leased the mill to Benjamin Moore, Jr. and four others who agreed to cut at least 50,000 feet of pine boards annually, with one-fifth of the product delivered to Read. [xii] Such deals were typical for the time – a landowner would acquire land, build a mill, and lease the mill itself for both an annual rent as well as a portion of the output. The fees collected for the documents issued in his position as Secretary of the Province in addition to the salaries that the other various positions that he occupied offered, coupled with his own private income provided a substantial income from which he could fund his greatest ambition – becoming an ironmaster. In the next installment of this series we’ll follow Read as he constructs, and nearly goes bankrupt from, his four ironworks. Charles S. Boyer, 67, well known historian and retired Camden business man, died yesterday at his home, 205 East Central avenue, Moorestown. He had been ill but a short time. As president and one of the leaders of the Camden County Historical Society for many years, he was considered an authority on early New Jersey history and was the author of several books and pamphlets. One of the most widely read of these is “Old Forges and Furnaces.” He was a former president of the Sons of the American Revolution of New Jersey, a former president of the Camden Club, a charter member of the New Jersey Harbor Commission, and a member of Trimble Lodge, F. & A. M. Born in Bethlehem, Pa., he was the son of the late Benjamin F. and Alabama Shimer Boyer. He received his early education at Friends’ Central School, Fifteenth and Royden streets, Philadelphia, and was graduated from the University of Pennsylvania in 1891. Mr. Boyer married Anna Wilson DeRousse in 1904, who survives. They live at 525 Cooper srteet(sic), Camden, for many years, moving to Moorestown, 11 years ago. Besides his wife and brother, Mr. Boyer is survived by a sister, Mrs. Jane B. Mecray, wife of Dr. Paul M. Mecray. Funeral services will be held at 2 P. M. Saturday at his late home in Moorestown. Burial will be private.